How do you treat music less like data and more like art, and make a business out of it? That’s the question Beats Music, a spin-off of Beats Electronics risen from the acquisition of MOG, wants to answer with their new music streaming and recommendation service. I first got wind of Beats Music in December, and, when I heard the news last week that Beats Music was launching to the public, I thought I wouldn’t care. As MacStories readers and The Prompt listeners know, I’ve been happily using Rdio for the past three years: Rdio gives me all the music I want, it lets me check out New Releases and subscribe to playlists created by other users, and it’s got a Stations feature that automatically recommends music I may like based on my history and listening data collected about me. There are many reasons why I prefer Rdio over Spotify, which I’ve shared on several occasions in the past. Rdio works: you type stuff in, you get music back. If you don’t want to search, the service gives music to you with recommendations that go from “good” to “great”. As coverage of Beats Music started coming in and cynics quickly derided the service for being part of a company that makes headphones audiophiles don’t like, I got curious. Beats Music’s CEO Ian Rogers, for instance, has a quite amazing story of being a pioneer of Internet-based music delivery and marketing, working (and touring) alognside Beastie Boys at a very young age, eventually going to work for Nullsoft, Yahoo Music, TopSpin Media, and now Beats Music. The creation of Beats Music itself was spearheaded by Jimmy Iovine (historic music producer and co-founder of Beats Electronics with Dr. Dre), who ended up hiring Nine Inch Nails’ Trent Reznor as Chief Creative Officer of the new service because Reznor himself had been looking for a new take on music streaming services. On a product level, Beats Music offers no free tier as it is a paid-only service that delivers 320kbps MP3 streams and promises to pay artists higher royalties thanks to the lack of cheaper, ad-supported streams. When I went to check out Beats Music’s website, I found an honest, well-written FAQ that explained the company’s vision and motivations for launching a paid service just after Spotify and Rdio extended their free tiers to tablets and desktops. 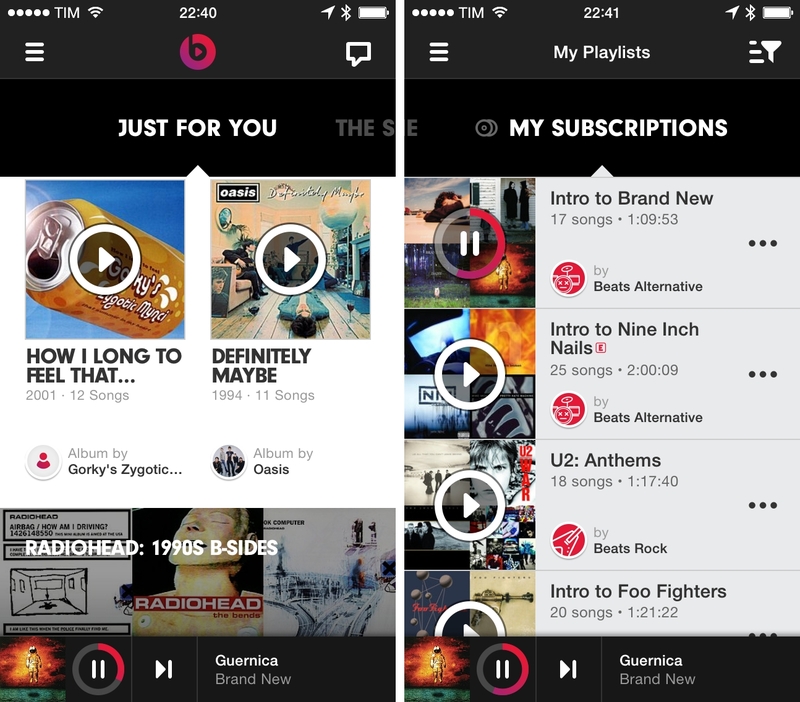 I could go on with a list of factors that contributed to piquing my interest in Beats Music. Such as the way Rogers worded his explanation of the service’s paid-only model, or how he explained their strategy to The Verge and then offered a simple screenshot as proof that ads in music may not always be the best option. Or how Reznor – for context, the guy who left his label to try “alternative” marketing campaigns that included leaving free copies of NIN songs in USB flash drives in bathroom stalls – said that “to brag about being agnostic and just providing access to music seems to me, as a culture person, as a fail” when asked about Spotify’s search and algorithm-based music platform. As a music lover and iOS geek, it seemed silly to dismiss Beats Music just because of others’ opinions about headphones, and I’m glad I didn’t. I can’t stop using Beats Music. The key to understanding Beats Music is that it’s got traditional streaming features like 20 million songs, major label partnerships, and search, but it doesn’t make the service strictly about those. Instead, Beats Music wants to focus on curation by music experts and personal recommendations that are based on algorithms and human taste. The latter is extremely important to see where Beats is going. The term curation, like other modern buzzwords, is frequently overused to indicate content that is selected among a larger pool of content. Apple calls its App Store “curated” because it’s got a review process, but take a look inside the App Store’s catalog and you’ll find obscenities that shouldn’t be allowed anywhere. 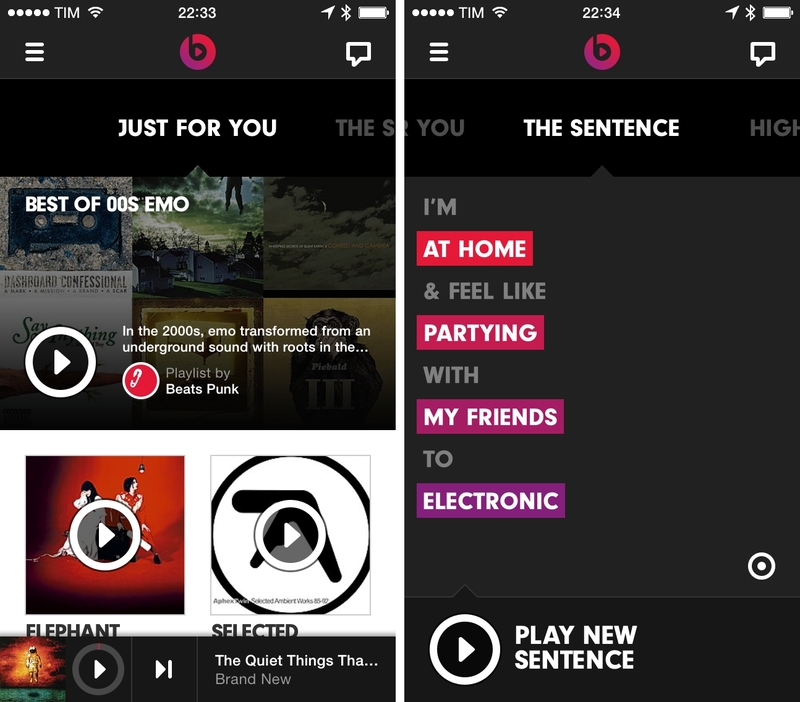 Beats Music assembled an editorial team to sift through the service’s millions of available songs and organize music in playlists, sub-genres, and recommendations that make sense for people, not just for computers. The team is headed by Scott Plagenhoef (Editor in Chief of Pitchfork from 2004 to 2011), and it comprises a large staff of people who know music and pop culture, artist influences, trends, and who follow music-related events such as the Grammys or the upcoming Brit Awards. The company’s goal of using traditional music streaming as the backbone for a service that prioritizes curation, contextual discovery, and meaningful recommendations is elegantly laid out in their first commercial, created by Trent Reznor. In the various interviews I’ve read over the past week, Reznor, Iovine, and Rogers stressed that Beats Music isn’t completely eschewing data-driven technologies to categorize music and build recommendations – they’re simply not making that aspect the core of the experience. They want to convince customers that infusing algorithms with the humanities is worth what can be considered a “premium” investment – a way of thinking that isn’t new to consumer technology. In practice, all these good principles are executed through an iPhone app that, by default, launches in a view called Just For You. While other services open to reveal Top Charts or albums and songs popular among people you follow, Beats Music presents a Home screen tailored to your tastes that includes playlists and albums you may like. Recommended playlists are displayed with beautiful edge-to-edge artworks, a mix of bold and thin typography, and profile pictures of the user who created the playlist (usually one of Beats’ genre-specific feeds, like Beats Alternative). In my tests based on a week of intensive usage, Beats Music’s recommendations have been excellent. After an initial onboarding process and a week of listening, Beats Music has learned, algorithmically, that I have a variegate mix of interests that span 90’s Brit pop, alternative rock, hip hop, new wave revival, 90’s/00’s punk rock, indie rock/pop, and more. To train the service about songs that you like, you can tap on a heart icon in the Now Playing screen; this will provide Beats with continuous data about your tastes and listening trends over time. Aside from “U2: Anthems” (which is a collection of popular songs, likely created primarily off popularity data), the other playlists have a distinct magazine-like nature in that they feel like mixtapes created by an actual person who knows music, not an algorithm. “Under The Influence: Oasis”, for instance, includes Stereophonics, The Racounterus, Kasabians, The Kooks, and Travis – artists whose songs show a clear influence of the Gallagher brothers when you listen to them. Audio waveforms have no meaning or history to a computer unless humans give them some. In Daft Funk, a playlist that contains material from Daft Punk’s Random Access Memories as well as their influences, you can find “Get Lucky” and “Lose Yourself To Dance”, but also Stevie Wonder’s “Another Star”, Chic’s “Le Freak” and “Good Times”, and The Neptunes’ remix of Daft Punk’s “Harder Better Faster Stronger”, which takes a different approach to the French duo’s hit. In “Kanye West: Songs About Women”, you’ll find West’s rap ballad “Runaway”, the groovy “Gold Digger”, and his more questionable work for Watch The Throne. I have a hard time believing that these selections have been made by an algorithm. If Beats Music actually figured out a system to let a computer do this – they may have cracked automatic music playlists forever. What’s actually happening here, I believe, is that Beats Music is leveraging their editorial team to manually curate and build playlists that are subsequently suggested to the user. The playlists themselves are created and maintained by somebody who knows music; the system takes care of recommending them to users who may like them, such as yours truly when it comes to Oasis. Another example of Beats’ curation is what happened two days ago for the Grammys. While Rdio and Spotify had simple playlists based on the nominees, Beats Music was sharing things like “Daft Funk”, “Pharrel’s Resurgence”, “Macklemore vs. Kendrick Lamar”, and “2014 Grammy Finale: The Songs That Come Next”. Each curated playlist has a description, shortcuts to featured artists included in the playlist, and subscribers. For me, what Beats Music is doing with curated playlists and recommendations is immensely better than a top chart or an anonymous recommendation. Because there are people handling curation behind the scenes, you’re told why a playlists contains certain songs over others. I was watching the Grammys live the other night, and a few minutes after Macklemore won Best New Artist, Beats Music tweeted the “Macklemore vs. Kendrick Lamar” playlist during a commercial break. On the same night, they also tweeted a photo of their editorial team watching the Grammys at the office, which should give you an idea of how simple the entire process actually is. There are two other kinds of playlists that I’ve noticed in Beats’ Just For You and that have been working well for me: Deep Cuts and Intro To. The latter gives you a handy mixtape of an artist’s most popular songs through the years so you can quickly catch up and get into their work. For just a week of data about me, my recommendations were good: I got intros to Nine Inch Nails, Passion Pit, and Foo Fighters. As the service learns which artists I’m already a fan of, I expect the quality of Intro To playlists to scale accordingly. Deep Cuts are exactly the opposite: if you’re a fan of an artist’s most popular songs, you get a playlist that contains lesser known songs. Beats Music already has a large selection of Hits, Intro To, and Deep Cuts playlists, which suggests that their team has been putting them together for months; some notable names like Death Cab for Cutie, however, only have Intro To playlists without Deep Cuts for now. 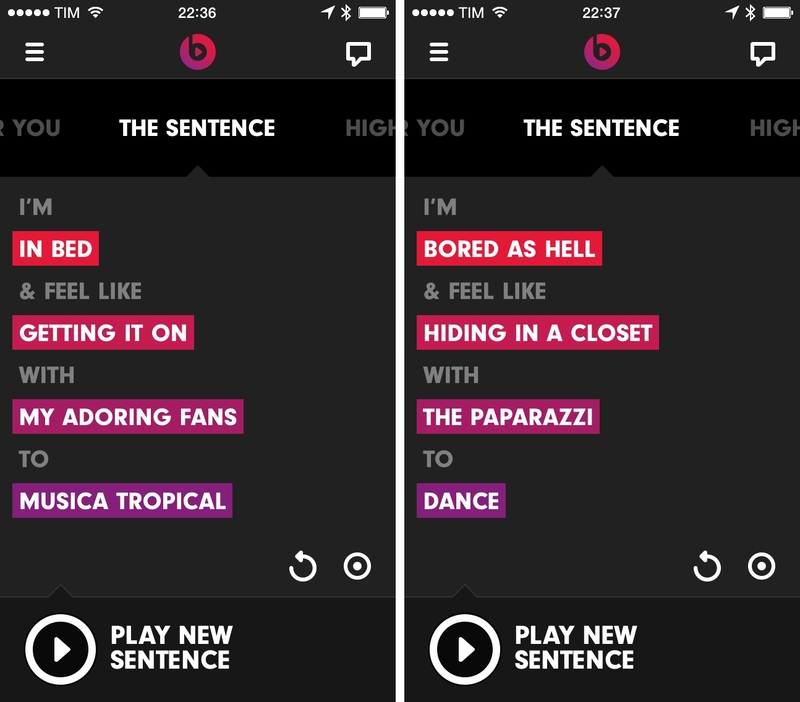 Beats Music’s other discovery/automatic playlist feature, The Sentence, is also the service’s most recognizable one. From the Home screen, you can swipe horizontally to move across sections listed at the top, which include Just For You, The Sentence, Highlights, and Find It. Highlights offers a series of items that have been featured by the Beats Music staff without being necessarily targeted at your tastes: today, highlights include an Intro To to Pete Seeger (who passed away today) and, to celebrate Rick Ross’ birthday, Teflon Don. In Find It, the app lists Genres, Activities (playlists for “cooking”, “dancing”, “dreaming”, “getting it on”, and more), and Curators, which includes songs, playlists, albums, and artists recommended by the likes of Pitchfork, Rolling Stone, and Alternative Press. It’s The Sentence, though, that steals the spotlight in how it combines regular, Pandora-like song shuffling with a context/mood-based menu to tell Beats what you want to listen to. The Sentence, as the name implies, lets you construct a sentence using variable tokens for location, mood, user, and music genre. You can request things like “I’m at my computer and feel like dancing with myself to pop”, “I’m in the car and feel like driving with my friends to indie”, or more absurd contexts such as “I’m underpaid and I feel like shoveling snow with my lover to metal”. As reported by Re/code, Beats explained that “the content, and the filters, are selected and tuned by humans, and an algorithm generates the playlist from your choices”. My results with The Sentence have been mixed. On one hand, while funny, I don’t understand how filters like “I feel like taking a selfie with your mom” or “I am faking an illness” may fit in my music listening habits; the selection of filters is huge and the interface to pick them is nice, but because of the many options available, the menu could be made faster with a search bar or support for voice recognition. On the other hand, building sentences with more traditional filters led to a great combination of hits and new songs I’ve discovered thanks to Beats Music. The Sentence is a terrific idea, but it needs to be quicker. It takes too many taps to choose the right filters or contexts, which aren’t sorted by frequency of use and that the app sometimes replaces with new ones. Users should be able to save often-used sentences, and filters should be sorted in some way. There’s a lot of potential for context-based creation of music stations, especially when you consider the sensors that an iPhone has and the data it knows about you (schedule, location, time, motion activity, etc). Beats’ decision to add a mood layer to context (the “I feel like” part) speaks to the company’s willingness to make music streaming more personal. The Beats Music app got off to a rough start due to post-launch scalability issues, but it’s a fine piece of software with some clever ideas, delightful UI touches, and nice transitions. 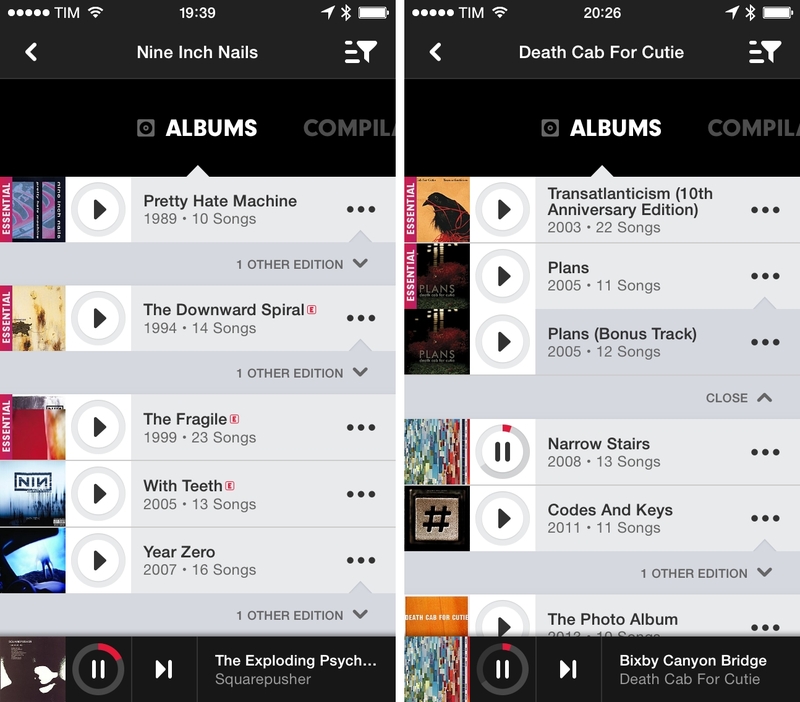 The app employs bold typography and dark UI elements for navigation, using edge-to-edge previews for playlists and a sidebar to search, view playlists, your library, and go back to the Home screen. 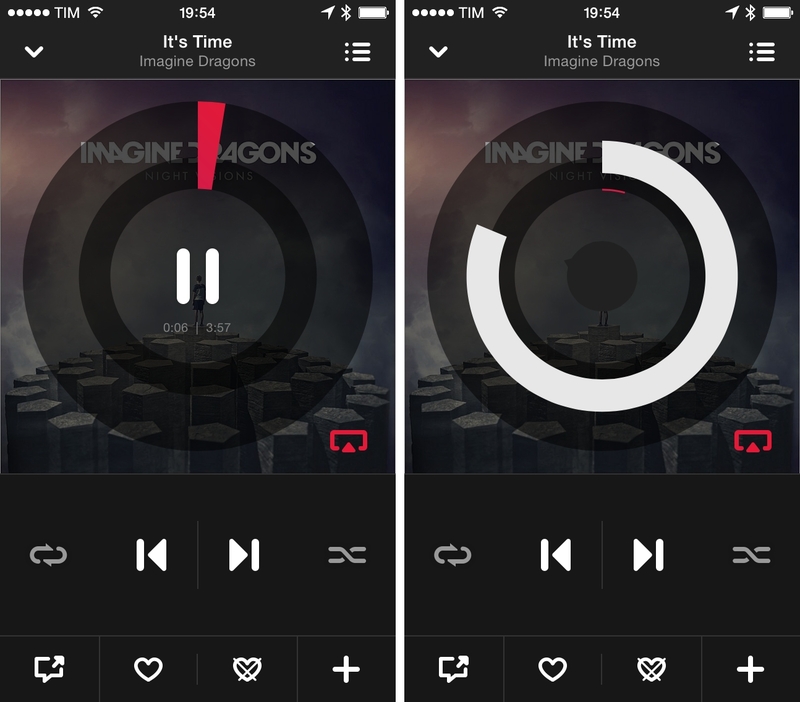 Beats Music has traditional features such as offline downloads, a library for your personal music collection, and a Twitter-like follow/be followed mechanic to interact with other users. The Library and Playlists view have, like the Home section, a swipeable gallery of sub-sections you can open, such as playlists you made or the ones you’re subscribed to, or classic Song/Artist/Album filters for your collection. Search is fast: suggestions are provided as you type, and results are organized by artist, album, song, playlist, and users. The Now Playing screen shows a series of curious choices. In the lower portion of the screen, there are buttons to skip, repeat, shuffle, like, share, and add a song to a playlist, your library, or your offline items. In the middle of the screen, a big Play/Pause button is surrounded by a progress circle that covers the song’s artwork, which is a questionable decision. There’s no volume slider: you have to adjust volume using the hardware buttons, which will change the on-screen controls. The Now Playing screen looks nice, but I have to wonder just how much usability has been sacrificed for good looks. How many people actually skip portions of songs manually to justify an always-visible progress circle that covers the artwork? Wouldn’t a volume slider be a more sensible choice? More importantly, Beats Music requires too many taps to get to an artist’s page or view albums. From the Now Playing screen, you have to tap the list icon in the upper right corner, which will take you to a list of songs in the current playlist/album from where you can tap on a song to view the artist’s album/EP/compilation it belongs to. From a navigation point of view, Rdio is superior with its tap & hold shortcuts to “View This Album” and “More from Artist”. Artist pages show a useful Latest Release section alongside Top Songs and Similar Artists, but discographies are tucked away inside a Music view that you need to open to swipe between categories. Everything requires too many taps and it should be streamlined to a faster navigation experience. However, Artist pages also show some welcome options for music lovers. Albums that have been reissued with different editions (like remasters) are hidden by default; in the Music view, compilations such as Death Cab’s “You Can Play These Songs with Chords” get their own tab. Right now, Beats Music is a young product that doesn’t have all the features of competitors such as Rdio and Spotify. There’s no iPad app or desktop client. There’s a web app, but it doesn’t have all the functionalities of the iPhone app. There’s no way to quickly view all songs you’ve liked, and the app lacks a general-purpose “for you” station that doesn’t require you to choose filters before listening to music (something that Rdio excels at with Your FM). When sharing, you can’t copy a link to a song or playlist – you can just tweet or post to Facebook. For me, the most glaring omissions are New Releases (coming soon), a History view, and an iPad app. I love how, on Rdio, you can see new notable releases every Tuesday and what you’ve been listening to lately. An iPad app should be next; in the meantime, I’m forced to use the iPhone app in compatibility mode on my iPad mini. I ascribe Beats Music’s shortcomings to the young nature of the product, not the vision behind it. In terms of what Iovine, Reznor, and Rogers want to achieve, Beats Music is already crystal clear: they want to augment on-demand music streaming with curation and personal recommendations, and in doing so they want to create a profitable business that pays higher royalties to artists, giving them more control for their artist pages and analytics. As a music lover and listener, I can only appreciate what Beats Music wants to achieve. Considering Rogers’ background, I believe it when he says that they’ll provide artists with tools to connect to their fans and control pages inside Beats Music. I can only imagine the possibilities of exclusive content availability on Beats, photo and video galleries from tours, and perhaps even integration with third-party services for selling concert tickets. The music streaming landscape needs a service that isn’t hostile (or impenetrable) to artists. As a user, Beats Music for iPhone is a good start: it’s got gapless playback, offline downloads, a large catalogue, a social layer, and impressive curation and recommendation features powered by an editorial team that’s constantly publishing new mixtapes and playlists. The Beats Music app has lots of personality, and, so far, it has given me fantastic recommendations for new artists as well as hits I already knew. Will Beats Music’s solid principles be enough to convince consumers to subscribe at $9.99 per month? Time will tell. Will the editorial team be able to keep up with daily contextual recommendations months from now, when the initial buzz will settle down, the celebrity endorsements will become quieter, and there won’t be commercials to promote the service to new users? 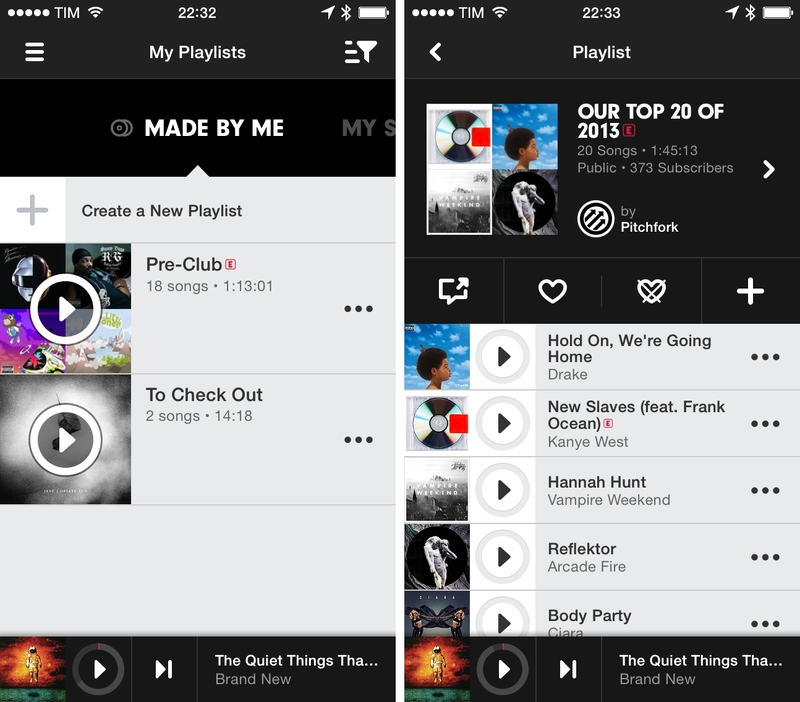 How will Beats Music organize all the custom playlists they’re creating? Will they also keep them updated? Again, it’s too early to tell, but we should keep in mind what Iovine & co. have been able to accomplish, in terms of mindshare, with Beats Electronics so far. Beats Music matters because music shouldn’t be treated only like a web search. The service has those features, but it wants to put people (users, editors, and artists) and their creations (playlists, recommendations, music) at the center of the experience. Personally, I think that it’s a great proposition, and I have subscribed to the monthly plan. Computers and algorithms, in spite of modern advancements in data extraction and parsing, don’t understand things like artistic influences, song meanings, subtle references, or the “mood” of a song. Computers can’t compute emotion. They can’t understand what’s behind Dave Grohl’s “Best of You” at Wembley or why Death Cab For Cutie’s Transatlanticism is an album about long distance love. Computers don’t have the human touch, and I believe that they will never be able to fully, empathically replicate the ability to appreciate music as an artistic expression. That’s why Beats Music hired people knowledgeable about music and uses algorithms as a tool, and not the medium: there’s more to music than data. If the plan comes together, Beats Music has a serious chance at reinventing how music streaming services should work. I’m optimistic.